Palingates was quick to report on the connection to Sarah Palin and the right-wing tea party - before last years elections, Sarah Palin posted on Facebook an image of America listing legislators that need to be removed from office (either by retirement, election loss, or by "second amendment remedy"), accompanied with crosshairs over the district they represent. 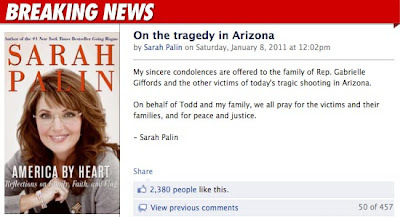 Palingates went into detail about the event, even displaying video of Giffords herself describing the threats of violence made against her from the extreme right - her office was vandalized shortly after Palin posted her graphic. Palin's hit list, coupled with right-wing rhetoric like calling for "second amendment remedies" and urging conservatives to not retreat, but to "reload," the right-wing message was just a recipe for disaster, but unfortunately the fringe conservatives (and mainstream conservatives who get their power from their violent base) will try and distance themselves from this unhinged individual. Sarah Palin even posted her condolences to the family the same way she posted her call to attack - through Facebook. 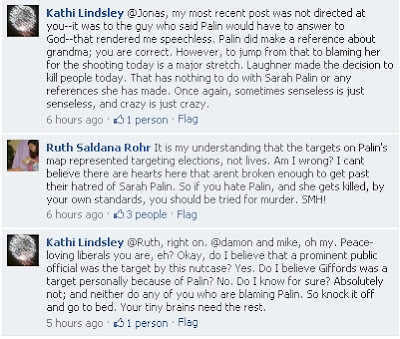 I thought it would be interesting to look at the comments made by fans of Sarah Palin and decided to scan some of the recent posts made on her infamous Facebook note - they were quick to ignore the rhetoric and and imagery used by conservatives and blamed liberals for blaming others. I'm not sure if Groves is aware of this, but the suspected shooter, Jared Loughner, like Palin, also used social media to spread his message, and in his various posts and videos he discussed the importance of the gold standard or the original constitution. "I won't pay debt with a currency that's not backed by gold and silver!" exclaimed Loughner. These incoherent ramblings could have been ripped from an episode of Glenn Beck! It appears Loughner considers the subsequent amendments to the original Constitution as nothing more then governmental mind control. It also appears that Loughner considers him a revolutionary trying to take control., but he tries to dismiss any claim that he is a terrorist. A terrorist is a person who employs terror or terrorism, especially as a political weapon. 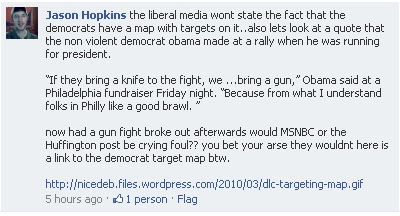 Some Palin supporters went out of their way to try and find examples of liberal "target" maps. The image in question comes from the Democratic Leadership Committee circa 2004. Verum Serum author John did point out the differences. 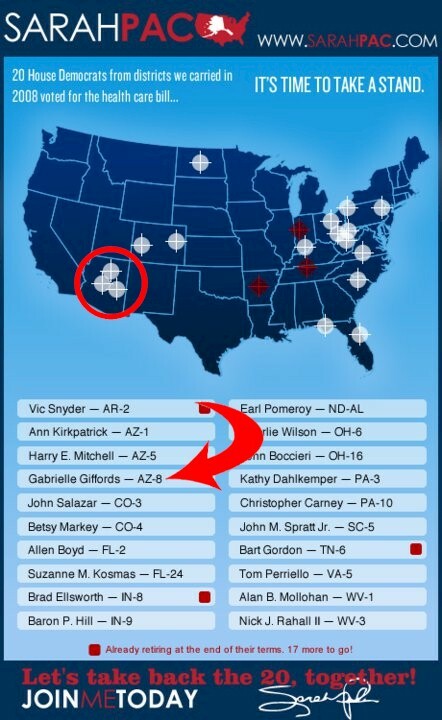 Granted these are bulls-eyes instead of gun-sights, and the targets are states not individual congressmen. But we’re really splitting hairs at this point. This map and the language it uses (Behind enemy lines!) are, if anything, more militant than what Palin used in her Facebook posting. I think the main point is that Sarah Palin did list specific people that needed to be taken out of office and she did use imagery and rhetoric associated with firearms. 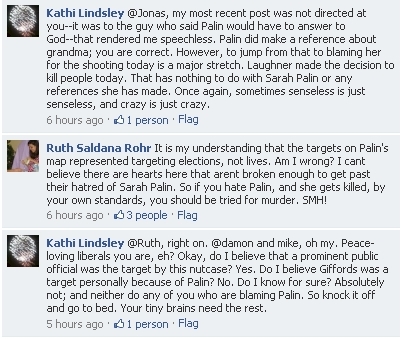 Excellent point Betty Lewis - if Palin's image was so innocent, then why did she remove it from her website? This man is obviously an anti-Christian, anti-government, conspiracy nut with anti-federal reserve ideas and delusions that he knows all and sees all the “brainwash” going on out there. This man is mentally ill and his ideas are mixed up between left and right with obvious paranoia underlying it all. Huston misses the point completely - right-wing imagery may have contributed to this mentally unstable person carrying out this attack - I'm not sure how Huston comes to the conclusion that Loughner is "anti-Christian" since nothing I have read (including Loughner's own words) indicates he is for or against religion - fellow high school classmate Grant Wiens stated Loughner wasn't "keen" on religion. As a side note, Huston's comments seem to describe tea partiers, well, to a tee. Teabaggers and right-wing nutjobs, like Andrew Breitbart and Glenn Beck, believe they know all and see all the "brainwash" going out there. They are also anti-government, anti-federal reserve, and to a degree, anti-Christian (their interpretation of the faith is horribly skewed). Maybe gwar5 failed to read Loughner's body of work, because stylistically, the "BOY BLUE" post is completely different from anything Loughner posted in the past, not to mention Boy Blue stated that they suffer from partial paralysis - a condition Loughner seemed to lack. That didn't seem to make a difference though - gwar5 posted the comment several times. Obviously Palin wasn't issuing out a hit on these peoples lives, but as a public figure deeply involved in the political world, she should understand the seriousness of her actions - they are the same as Mahmoud Ahmadinejad calling for the "death of America" or Kim Jong Il threatening to turn the Sea of Japan into a fiery nuclear wasteland. It is pretty clear that America is not going die and North Korea is not going to attack Japan and South Korea, but there are those people that this kind of rhetoric incites - just think of the countless terrorists who have carried out attacks on America who have made similar comments. Now ask yourself when was the last time the Iranian government launched an attack on America. Based on the logic of Palin's carefully screened fan comments, Charles Manson should be set free because he did not murder anyone. The wingnuts simply do not get it. There is a huge difference between showing a bulls eye over a state and saying you are targeting the state for a political victory and naming names and showing a rifle scope. It will be very interesting to if this maniac talks to the police. If he admits he visited the Palin website and it influenced him, old Caribou Barbie might just have to go back to the poor house. Finally, my thoughts and prayers go out to all of the victims of this heinous crime. There is no benefit, but the Feds are bringing murder charges. As you saw with McVeigh, this limits his appeals if he is sentenced to receive the "happy juice".